The road to maturity is paved with regret. We all do stupid things when we’re younger. We indulge in thrill seeking. We leap at opportunities without weighing the consequences. Sometimes these indulgences lead to memorable experiences to be cherished. Sometimes it leads to tragedy. In either case, we usually learn some important lessons about the world and our place within it. That’s what life is about. But AT THE DEVIL’S DOOR is not real life, it’s a horror movie. And as we should all be aware of by now, horror movies stress punishment and destruction in a way that makes Draco look like the Dali Llama. Shortly after falling for a guy, teenage Hannah (Ashley Richards – AWKWARD) agrees to play a mysterious game where she will sell the devil her soul. For this, she is paid $500, which just goes to show that Hannah probably should have haggled at least a little bit. She is told to go to the crossroads and say her name so the devil will know how to call her. Personally, if the devil needs this in order to collect, I don’t see why you wouldn’t just give a fake name. Of course, having Satan repeatedly asking in vain for “Skippy McFluffletweet” would have made for a much shorter, but much more amusing film. Hannah is just one of the women we follow. Leigh (Catalina Sandino Moreno – MARIA FULL OF GRACE) is a real estate developer who satiates her loneliness by overextending herself at the workplace. Like many in this line of work, Leigh buys up houses in foreclosure and helps families who realize they can no longer afford their dream home. The problem areas of the economy are a recurring theme, from the cheap price Hannah pays to the plight of the middle class as seen by Leigh. Even as the American economy is improving, people struggle as much as ever. Families are torn apart as unemployment, underemployment and cost of living expenses results in them scraping just to keep their heads above water. At the same time, corporations post record profits, avoid taxes and legal penalties and the divide between rich and poor grows ever wider. I have gone from wondering how we’re going to get ourselves out of this mess to wondering how long my beloved country can survive. If this sounds like I’m going off on one of my bothersome tangents, it’s not really as much of a departure as you might believe. The struggle for survival and the envious safety of those insulated by such struggles are part of this film’s allure. 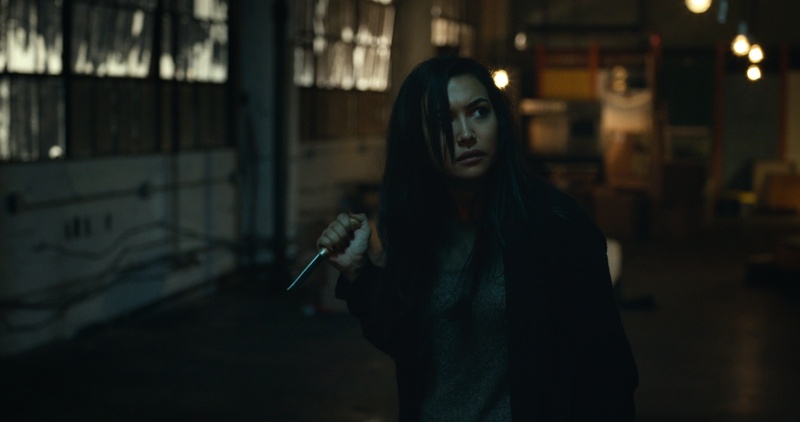 It’s all about desperation in this movie, just as it is with the third female protagonist, Vera (Naya Rivera – GLEE), a struggling artist and the sister to Leigh. While preparing a house for resale, Leigh spies Hannah, dressed in a red raincoat, lurking in the shadows. At first, she thinks it might be the previous owners’ missing daughter, but she soon realizes something much stranger is going on. She pursues Hannah through the house, but anyone who has seen DON’T LOOK NOW should know nothing good comes from pursuing anyone wearing a red raincoat. Meanwhile, Vera deals with her own loneliness, failing art career and often contentious relationship with her sister. She too will feel this force creeping into her life. All of these women are unwittingly placed in the middle of a supernatural event, when a demonic force, perhaps the devil himself, takes an interest in them. Though it takes our characters a long time to figure it out, it seems plenty obvious to the horror aficionado that the devil wants to be born into a human host. AT THE DEVIL’S DOOR shifts time periods and shifts focus between these three figures. This approach is inventive, if a little disorienting. But not if you consider that AT THE DEVIL’S DOOR isn’t the story of any of these three women. It’s the devil’s story. It’s his quest that the film is about and his thread that we follow. That this force is unable to convey its thoughts and feelings directly means that by definition, the figure is shrouded in mystery. Thus, we have Hannah, Leigh and Vera all offering their separate reactions to this insidious force that creeps into their lives. All three actresses give strong performances and it’s refreshing to see a film where the women are neither weak, nor do they require a male figure to lean on for support. Nicholas McCarthy (THE PACT) knows his way around the dark corners of the horror film. He relies extensively on mystery, shrouding much of the action in shadows. Sound design is also important. Whether it’s the strange noises emanating from the ether or Ronen Landa’s alternately creaking and stinging score. Sound is manipulated for effect so frequently that I began to hear subliminal messages where it’s likely none were present. Midway through the film, one of the women is facing the specter of possible demonic motherhood. She sits in her car, the rain pounds outside. For a moment, I swear it sounded like the windshield wipers on her car were saying, “mama, mama…” Creepy stuff, kids. One of the more interesting themes in the film is the idea of rebellious spirits and the forces they open themselves up to. Both Hannah and Vera are accused of living their lives recklessly. It’s suggested that Hannah would not have done what she did if she hadn’t thrown caution to the wind. Likewise, Leigh is constantly worried about Vera. She tries to get her to meet the right guy, have the children she can’t and move to the suburbs. The suburbs are a figure in AT THE DEVIL’S DOOR. There is a sense that if one can escape the city and the freefalling uncertainty of being single and childless, their lives will be fulfilled. The new American Dream is not realizing your potential, it’s escape. As it is presented here, people don’t seem to move to the suburbs and start a family for any personal fulfillment. Instead, it’s often treated as if they are running away from something. The stability of family life offers an overall feeling of safety. The families living in the suburbs, insulating themselves with spouses and children feel safe from the consequences of their misspent youth and even the supernatural forces that exploit those decisions. 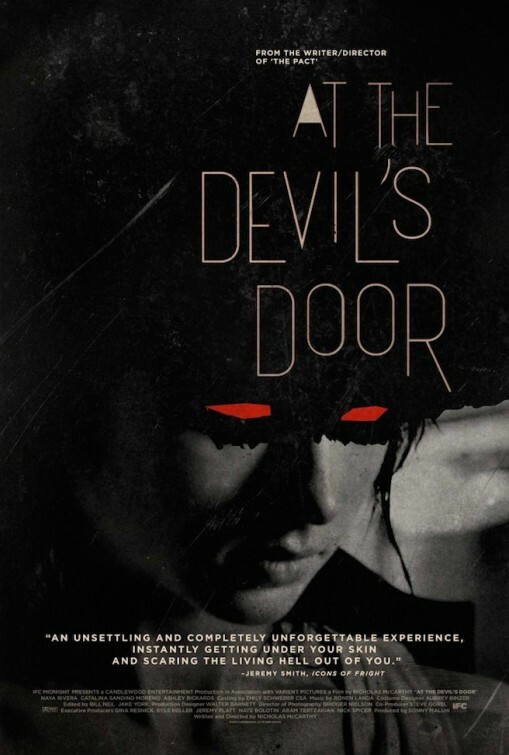 AT THE DEVIL’S DOOR is a film that is perhaps a little too ominous for its own good. Nevertheless, it does offer a fresh and original look at a classic horror trope. Recommended.